PETER LEMOS (Chef/Owner) hails from the high desert, and is a graduate of The California School of Culinary Arts. He has worked in some of the finest kitchens on the California coast, such as SPQR, Étoile, Craft, Bazaar, and L&E Oyster Bar, and even had the pleasure of competing on Food Network's Chopped. In his 10 plus years of experience, he has performed in every kitchen staff position imaginable. His passion for cuisine is immeasurable, there is love in everything that he touches, and he looks forward to welcoming you to Wax Paper. LAUREN LEMOS (Co-Owner) was born on Honolulu, Hawaii. Being the daughter of a career Naval officer, she has lived all over the world. She holds a BA in Theatre Acting from California State University Fullerton. She's worked in the front of the house at many places in LA such as L&E Oyster Bar, The Ace Hotel DTLA, and Sweet Lady Jane. With Italian roots, hospitality is in her blood. She met Peter working in a restaurant, they fell in love, got married, and here they are. BENJAMIN CAVAR was born and raised in NYC. He is graduate of Oberlin College as well as The French Culinary Institute of New York. Working in kitchens such as Double Crown, Lulu & Po, and Bar Bolonat, he has a deep love of food. He came to Wax Paper with a feeling of like-mindedness to Peter and Lauren, and it was a match made in Heaven! If there were a contest for the most beautiful and precisely chopped onions; He would win it. We are grateful to have him as a part of the Wax Paper family and team. MELISSA KANE was born in Pittsburgh, PA. She recently hails from New Haven, CT. She began cooking pastries in her father's restaurant when she was only a teenager, and has since been cooking for almost 20 years in personal and professional kitchens. Melissa has a deep love for story telling through food, and brings so much joy, talent, and love to our team. MIKEY MENDOZA was born and raised in Eagle Rock, CA. He was (and hopefully still is) a loyal patron of Wax Paper, and when we asked him to come work with us, he responded with 'Whatever you guys need!' He loves rock climbing, music, and Tiki Ti. He does not like ketchup. He is an asset to our small team, and we are thrilled to work beside him! You can find him crushing the register five days a week..."Eeeeyyyy!" GEORGE UCH was born in Yucatán, Mexico and raised in Inglewood California. He worked for Heirloom LA for eight years, and you can say this has made him a bit of a local industry celeb! His favorite thing to cook and adventure off on is smoking brisket, pork, or anything he can put his hands on. From George, ‘ My favorite aspect of working in a kitchen is I’m always learning.’ A newer member of our family, George has already proven to be an asset to our small team. ARVIN PARAYNO is an LA native…and he’s also Mikey’s cousin! 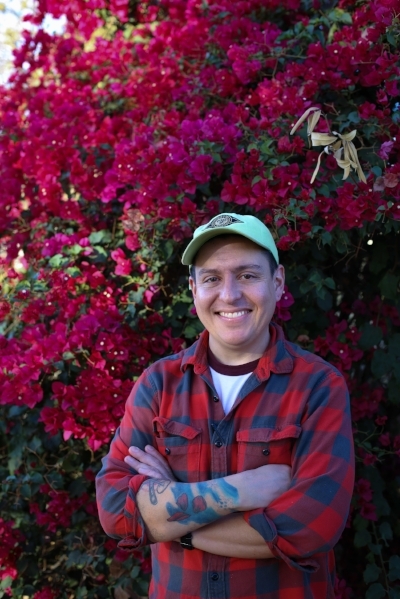 Formerly of The Oinkster in Eagle Rock, Arvin, like Mikey, is somewhat of a local celebrity, due to the passion, heart, and soul he brings to the LA food & hospitality scene. You will never catch him in a bad mood, and if he tells you “I see you,” it means he likes you! Arvin never hesitates to lend a helping hand. We are grateful to have Arvin as a part of our team. MARCO BADARACO was born and raised in echo park. He was our neighborhood mail carrier here in Frogtown, and that’s how he came to be friends (and eventually an employee) of the shop! He is a proud local, and also a very proud dad of two boys. He is a self-proclaimed food enthusiast! He loves rainy days, scary movies, best friends, sweet tunes, and hot cheetos for sure! He is ‘stoked’ to be a part of the team, and we are equally stoked to work beside him. PRISCILLA RUIZ was born & bred in North Hollywood by Peruvian immigrants. She enlisted in the United States Marine Corps at 17, and has served two tours in Iraq. She’s worked in beloved food spots like Pine and Crane. Holding a B.F.A. in photography, she is also going for her MA in Special Education. She loves her husband Buddy, and they’re proud parents of their daughter Penelope. She is also working on a Motherhood Support group with her friend Lauren, learning about the wisdom of plantitas and hierbas. We’re thrilled to have her on the team. MELVIN MENENDEZ was born and raised in Los Angeles. His interests include wrestling, soccer, and sandwiches (no joke)! A trip to Europe ignited his passion for food and quest for the perfect baguette in LA. This quest lead him to discovering Bub & Grandma’s bread, which then lead him to us! He is currently enrolled in the Culinary Arts program at LA Trade Tech, is proud to be a part of our team, and the feeling is mutual! VICTOR SALAZAR is our newest team member. He hails from the San Gabriel Valley. He has worked in many great kitchens such as Pie Hole LA, Sqirl & LASA to name a few! He loves looking for new food. In his spare time, he likes to hang with his cats and is a self proclaimed “plant daddy.” He is also an accomplished musician, and you can hear him strumming or singing in the band La Mer.